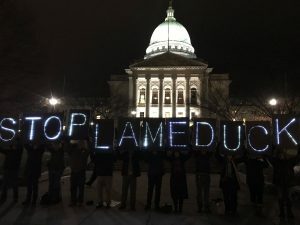 WASHINGTON – Truth Wins Out harshly condemned the undemocratic “bad faith power grabs” in Wisconsin and Michigan by lame duck Republican lawmakers as coups that must be met with implacable resistance. These are not simply differences of opinion or a “both sides” debate on policy preferences, but an outright demagogic assault on our democracy that cannot and must not stand. Truth Wins Out strongly urges citizens of all political stripes, who care about the integrity of our elections and have a sense of decency and fair play, to swarm Lansing and Madison to boisterously demand that Republicans immediately back down and stop trying to entrench themselves in power by hijacking democracy. GOP legislative coups first began in 2012 in North Carolina. After winning both houses of the legislature and the governorship, Republicans aggressively undermined that state’s democracy by severely gerrymandering legislative districts, essentially locking in their power at the expense of democracy. They also quickly moved to suppress voters by passing new laws and regulations that made it more difficult to vote – especially for minorities and students. When voters rejected their unseemly overreach in 2016 by electing Democratic Gov. Roy Cooper over incumbent Gov. Pat McCrory, the Republican legislature cooked up a scheme to strip the incoming Democrat of his power and privileges. This is especially insidious because while Cooper was elected statewide, the authoritarian lawmakers taking away his power represented gerrymandered districts that don’t actually represent the will of the majority of North Carolinians. After getting their clocks cleaned by Democrats in Wisconsin and Michigan, GOP lawmakers in both states are attempting to pull a North Carolina in lame duck sessions, audaciously stripping the incoming Democratic governors, and other key offices, of the political power entrusted to them by voters. In Florida, Republicans also inflamed tensions during the recent gubernatorial and Senate races, portraying legitimate efforts to count every vote as attempts to steal the election. Such reckless and irresponsible tactics are corrosive and do untold damage to our system, says TWO. Founded in 2006, Truth Wins Out is a nonprofit think tank and advocacy organization that fights against right wing extremism and anti-LGBT prejudice and discrimination.